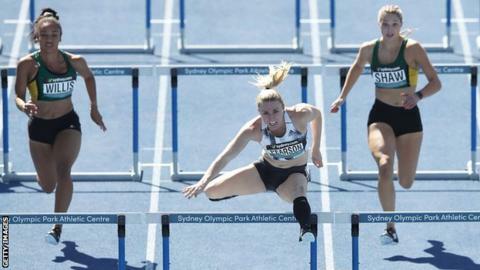 Two-time world champion Sally Pearson ran her first 100m hurdles in 14 months as she made her comeback from injury at the Australian National Championships. The 32-year-old won her heat in 12.99 seconds before pulling out of the final because of fatigue. "After the race I felt like I was overheating, my legs felt like lead and I just needed to get out of there," said the 2011 and 2017 world champion. "I'm disappointed but I'm actually going to listen to my body this year." Pearson had to pull out of the 2016 Olympics because of a torn hamstring and withdrew from last year's Commonwealth Games in her home country because of an Achilles problem. However, she is planning to go for a third world title in Doha in October. "This was my first hurdles race for 14 months and a lot of that 14 months was rehab, trying to get back into training again," said the 2012 Olympic champion. "Then from about October or November it was trying to get fast again and then the first race. So it was all in a very short amount of time to get back up to 100%. "My body is just saying 'don't do it, you don't need to run now, you've got six more months until the World Championships'. "At the end of the day you've got to respect your body and that's what I'm doing at the moment." Read more: Is this 16-year-old the next Usain Bolt?